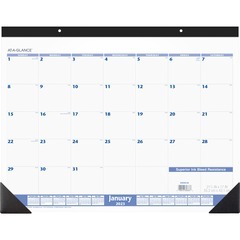 Our Bestselling At-A-Glance Calendars: In Stock Now! One of our most popular calendars! A convenient way to view the past, current & future month on one page. Sturdy cardboard backing to stand on its own. Major holidays and Sundays are highlighted in red. Perfect for appointment setting, planning, and quick reference. Stands 9" high by 4" wide.